Minnesota winters are not to be born anymore so my escape for many years has been Palm Springs, CA; it’s consistently warm with tremendous mountain views and a walkable, friendly community. No matter where you go, you are bound to meet either a Canadian or a Minnesotan, probably because of proximity (Canada) and several direct flights (Minnesota). One of my favorite things about PS, are all the street fairs/markets. PS has at least two every weekend, a Farmer’s Market and the Palm Springs Street Market. Then, on the first Sunday of the month is the Palm Springs Vintage Market. Click to read the 2014 post featuring the Cardinal Travel Trailer and Von Briggle pottery. This year, my last day in PS was on February 1st; my checkout time was 11:00 AM and my flight didn’t leave until 6:30 PM–plenty of time for the Vintage Market. My favorite thing to do is schmooze with the vendors; it’s amazing what you learn. This year it was textile blocks at Vintage Addictions. 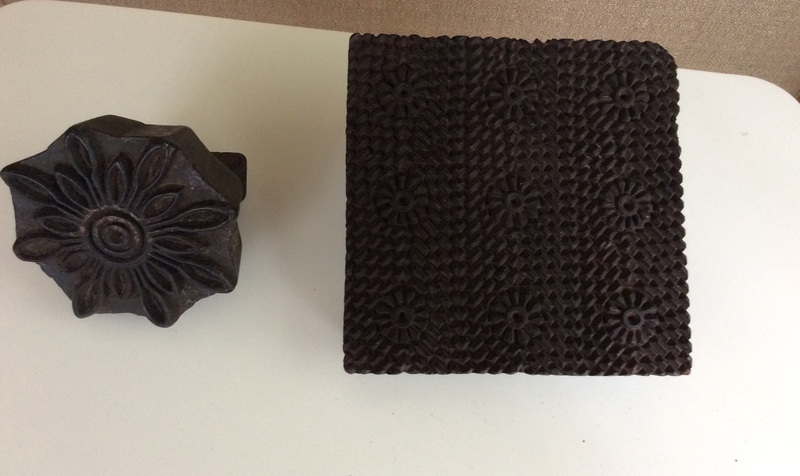 Although there were plenty of repurposed vintage auto parts, the textile blocks from India are what attracted me. I had recently read Kate’s blog on Tesselation Printing, so block printing was fresh in my mind. Steve and Alesia travel the world to find vintage-inspired products. They believe, as I do, the back story is the real beauty behind the artisans and craft items. And the textile blocks are true works of art in themselves. Steve told me the teak blocks are retired designs from India where they saw the ancient, traditional methods practiced. And they were amazed at how fast the craftsmen were in stamping out yards of cloth at a time all the while maintaining the registration marks. They tried the stamping and quickly learned it’s not as easy as it looks. The work of these skilled crafters would challenge modern day screen printing. Block printing is a simple process, e.g., children’s potato prints. It was even often a part–a sophisticated part–of college beginning design classes. But the Indian printing is way beyond a potato or linoleum block. I had to research the art of block printing in India. It is an ancient, tradition and the artists are highly skilled. As with many traditions, the skill is passed down through generations of family. To get a feel for the art of block printing in India, watch this brief video which takes you through the design and carving of the blocks, to the fabric preparation and the stamping. For more detailed information about the different types of printing, inks, etc., click here. With any block printing, it is important to have a smooth, continuous pattern. Each stamp must be accurately placed with the previous stamp(s). Registration marks on the blocks facilitate this process but it is also an acquired skill when stamping yards and yards of fabric where speed is important. It seems block printing is back in my life; it may be just some thing I appreciate or I may actually make use of the blocks I bought–only two due to luggage space! Or they may be decorative pieces on a bookshelf! What is your experience with creating your own fabric design? This entry was posted in OUT AND ABOUT and tagged block printing, fabric printing, India, India Textile Artisans, textile blocks, Vintage Addiction.com. Bookmark the permalink. 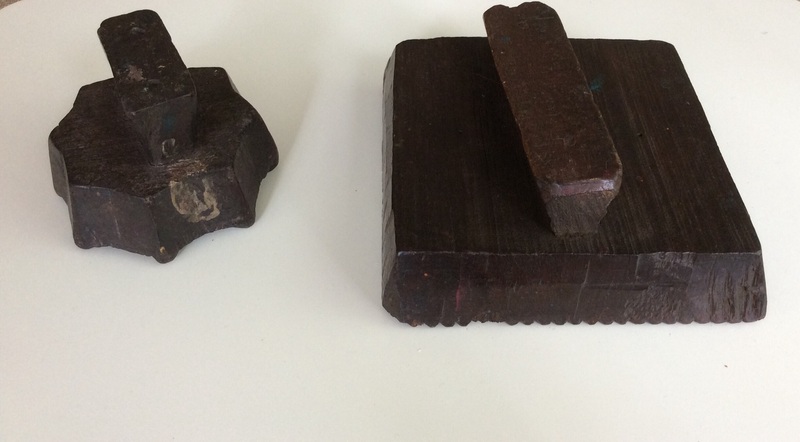 Gosh – nice wood blocks – I have one at home and it has been an ornament for a few years. When I got into block printing I gave it a go and it worked really, really well. Nice crisp printing, so I expect these two will print really nicely too. You just can’t imagine how they will look until you print with them – so I hope you do. Am planning on trying out the blocks. What paint/dye product do you recommend?